He is the creator of the Noah's Ark Circus and is referred to as Father by the tier one performers. 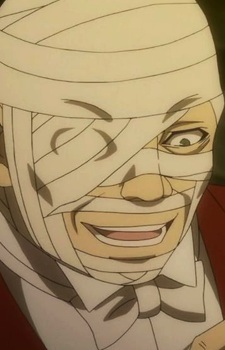 Except for his left eye, his entire face is covered by bandages. He seems to have a great love for children and uses his circus as a way to kidnap them. He then brainwashes them and has act them as his servants. However, he does not care for their well being and even finds it entertaining when he has them die gruesomely while performing in a circus without training. He knew Ciel as a small boy and recreates the room Ciel was branded and caged in as a child.He is infatuated with Ciel, blushing and saying it is like a dream to have Ciel beside him. It is insinuated that because of this infatuation he has kidnaps children. When he first met Ciel and he believed he was too ugly and underwent many surgeries for Ciel, only to believe it a waste when he hears the Phantomhive were killed. He is later killed by Ciel and his mansion is burned by Sebastian.